IIM Lucknow has released the shortlist for MBA aspirants seeking admission in 2019-21, PGP Batch. Find out your status to seek admission in the top B-school of Lucknow. IIM Lucknow offers three major MBA specialisations. The first course is general PGP programme, while the other courses include specialisation in agribusiness Management and sustainable management. The Post Graduate Programme at IIM Lucknow is a two year, full time, residential program. It is targeted at the candidates who aspire to become managers and contribute in the holistic growth of an organisation. The programme aims to generate capability of 'learning to learn' for nurturing successful managerial career of the PGP aspirants. IIM Lucknow holds excellent placement record for getting the entire PGP batch placed even before the completion of the course. The unique summer internship programme is an added boon which gives exposure to the candidates even before the final placements drive is conducted in the campus. Post Graduate Programme in Agribusiness Management is a two-year, full -time residential course, designed with an aim to develop agribusiness leaders. The agri-business is considered as the backbone of the nation that contributes considerably in the GDP of the nation. The programme nurtures future managers who can effecienty and effectively manage the agri-business sector. The highlights of the programme include live projects, case studies, international exposure through student exchange programme. Postgraduate Programme in Sustainable Management (PGPSM) is a to-year full time programme that has been designed with an aim to ensure that the future managers understands evolving and interactive nature of sustainability challenges faced by the organisations to thrive in the competitive market. Thereafter, the course curriculum has been defined to sharpen the skills of the candidates that will help them come up with integrated, holistic solutions to such challenges. Candidates should hold a Bachelor’s degree in any discipline with at least 50% marks (45% in case of SC/ST/PWD category) or equivalent, with at least two years professional experience. Step 1: The CAT advertisement usually appears in the National dailies in the month of July or August. 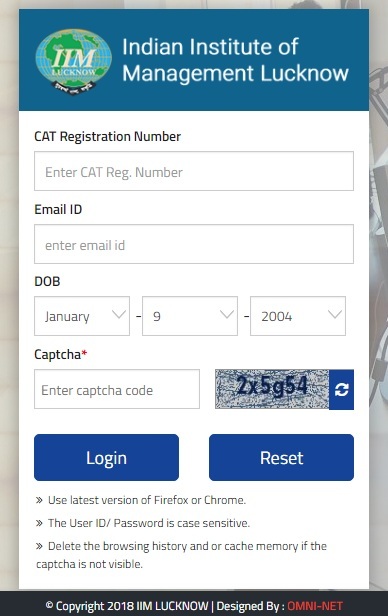 Candidates need to register for the CAT 2018 exam on the official website i.e. www.iimcat.ac.in. Candidate must appear in the CAT 2018 exam and are also required to score minimum required sectional and overall percentile in CAT 2018 exam as expected by IIM Lucknow to be considered for first stage screening process for admission for the PGP course. Step 2: Candidates who get shortlisted in the CAT 2018 exam are then called for the Personal Interview (PI) and Written Ability Test (WAT) round. Step 4: Final Admission Offer will be made to the candidates in the last week of April 2019 on the basis of Final Score which is derived after awarding the weightage scores on all the components mentioned in the final admission selection criteria. Work Experience will carry a maximum weightage of 10% in the shortlisting criteria of IIM Lucknow for admission to 2019-21 batch. Only paid and full-time work experience of more than 6 months, acquired after completing the Bachelor’s Degree will be counted as on July 31, 2018. A female candidate will be awarded a weightage of 5 points by IIM Lucknow during the shortlisting criteria for admission 2019. Admission cut-off plays a vital role in the admission process for the IIMs. Every IIM release their separate admission cut-off which specifies the minimum CAT cut-off score which a candidate must score in each section and overall exam to be eligible for the further rounds. All the candidates shortlisted in the first round are eligible to participate in Final selection round for admission to IIM Lucknow. IIM Lucknow awards 40% weight to Personal Interview(PI), 10% weight to Writing Ability Test (WAT); 30% Weight to CAT 2018 score, 10% to Academics, 5% to Work Experience and 5% to Diversity factor in the final admission round. The total programme fees payable by PGP students at IIM Lucknow stands at Rs. 16,00,000/- for the PGP batch 2018-20. The programme fee does not includes any expense incurred on the part of laptop/computer, personal expenses on boarding, travel, clothes and laundry are extra. However, it is expected that the programme fees for the 2019-2021 batch may increase further as per the decision of the admission committee at IIM-L.
IIM Lucknow, which is located in the city that takes pride in the Nawabi culture, is another gem for the management aspirants. Every year lakhs of candidates apply for grabbing seat in the IIMs and the popular PGP course. Spread over 185 acres of land, the institute has earned considerable name and fane in the domain of management and the PGP course is widely recognised in the industry. Here are complete details on getting admission in IIM Lucknow.